This menu is part of the page "Medieval Fortune Charm to Keep the Lover" on "www.AvalonsTreasury.com". By becoming more attractive this medieval fortune charm helps to keep the lover. According to old belief amulets and talismans are tools to trigger changes in life. Old grimoires contain instructions on how to build these charms in a way so that they can use positive planetary energies to fulfil their purpose. For this talismans transfer positive powers while amulets grant protection by absorbing negative energies. The biblical king Solomon established the Jewish secret doctrine of Kabbalah and his wisdom is the foundation of all western magic until today. 3000 years ago he wrote the magic book "Key of Solomon" - also this talisman is built according to these magic instructions. This old talisman originates from the magic book "Key of Solomon" - in medieval times this charm has been extended using Christian symbols. According to old belief this medieval fortune charm helps to keep one's lover, to become more attractive for the beloved one and to develop trust in God. 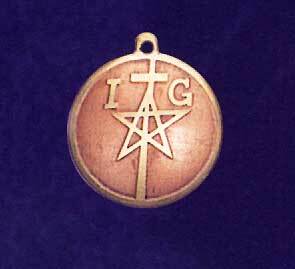 The letters I and G on this talisman stand for the Greek word Iehovah and its English translation God. In medieval times biblical talismans were popular because people thought that the bible contained a secret code which was believed to reveal the energy structure of the whole universe - adepts could therefore use this code in order to cast magic. It is said that these adepts handed down their knowledge orally for generations so that it could be recovered in times of need. This charm combines a magic pentagram with the Christian symbol of the cross expressing the plea to God that he shall preserve love and affection in the wearer's life. Among other things medieval knights of the 16th century wore this pendant not only as jewelry but also as an aid to achieve changes in their lives. This magic talisman was very popular because according to old belief the correct choice of symbols and materials was everything needed for this kabbalalistic pendant to work and therefore it was not necessary to charge it. This pendant is made of brass and copper. With the exception of gold copper is the only colored metal and just like silver and gold it is classified as a precious metal. Due to its softness and malleableness copper is particularly suitable for the jewelry production. The brass, a copper zinc alloy, is responsible for the yellow golden parts of this piece of jewelry and the copper for the red golden ones. "Medieval Fortune Charm to Keep the Lover"
This jewelry belongs to the jewelry line up "Fortune Charms". Page: This medieval fortune charm according to ancient belief helps to keep the lover.